Since its inception over three decades ago, Fish Window Cleaning has been dedicated to being a considerate and respectable neighbor in the communities where we work and live. 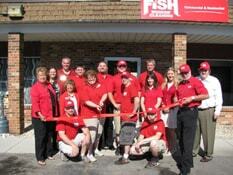 FISH partners with nonprofit organizations on an ongoing basis to support causes across the United States. Through volunteering, leadership, and charitable giving, FISH lives its mission to be the best and most respected window cleaning company in the world. Fish Window Cleaning franchisees support many organizations on an individual basis that they are passionate about inside their local communities. We are proud of the generosity of our people as we continue FISH’s legacy of philanthropy in our communities.